Errol: Yes, I am doing a comic. I don’t know why I am doing a comic, but I just can’t help myself at times. Will it be daily? Weekly? Just one time? I have no idea, but there is a story arc I have in mind. 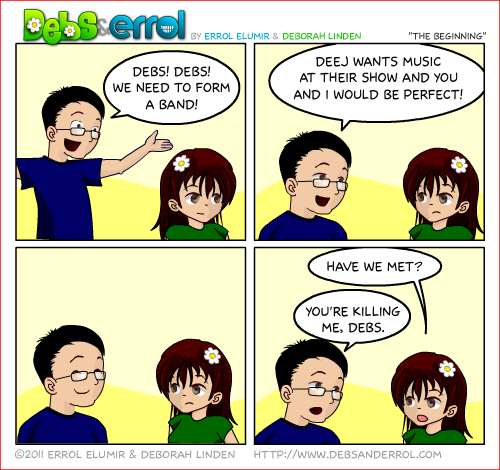 In fact, that story arc is how Debs and I began as a group. From then on, I will chronicle our daily escapades as we try to ‘make it’ in this big world of the entertainment industry. Awesome! I can’t wait to see more! They’re head and shoulders above us all! (That’s why no legs, right?) Good one, Debs&Errol! I look so angry in the third one for some reason. It SO wasn’t actually like that. Was it? Hi Debs! Hi Errol! You Are my favourite band!!! !!!!!!! your awesome!!! You are awesome too, David!! !